George Davies Turf may now be widely recognised as one of the leading turf suppliers in the country, but the business has taken enormous strides since 2001. This page is dedicated to showing you our story so far; right from the early stages when we had just the one lorry and fewer clients. We feel it's time to show our customers our story along with some photographs that we've held on to down the years. It's only by looking at these images whereby you can begin to realise just how far we've come and hopefully we'll have plenty more to add to our story in the future. The lorry above was our first and at one point it was actually our only lorry so it will always be remembered for our business in the early days. As you can see from the photograph; it never looked out of place on a patch of grass. These were the two tools that helped our business process and develop turf orders in the early years. The combination of the lorry and forklift certainly provided the winning formula as our list of clients started to grow. It's fair to day that we wouldn't have made a name for ourselves without our original lorry and forklift truck. The photograph above is a typical shot of the George Davies working environment, and while the lorry may not have been able to handle the amount of orders that we can process today. Even in those days it was paramount that turf was delivered on time and where the customer wanted it, even if that manually handling the turf and very long days. One lorry soon turned into two as our orders increased, and we welcomed our red Volvo FL10 to the team, along with a new forklift truck. The introduction of the forklift was a massive transition for George Davies Turf, this meant we could move away from manual to mechanised off load, whilst being able to massively increase capacity of the business. As you can see the Volvo was significantly larger than the Mercedes which meant we could store a lot more turf and provide an even better service. The Volvo became our first choice vehicle though large orders meant we were still regularly using our original truck. Customers could see us coming in the bright red Volvo and it was around this time when we really began to get into our stride, and that of course meant we would have to consider upgrading our George Davies Turf vehicles once more. This day will always be a memorable occasion and it was the delivery day of our Scania R420. It was certainly an upgrade to the Volvo and you can see we decided to stick with the red colour this time. The Scania we had even more room for more turf, whilst we managed to add our name to our side curtains. Whether we were delivering soil or turf for small or major projects the Scania could certainly handle the load. The R420 has added maneuverability with its rear steer axle, making deliveries significantly quicker and easier than ever before, and this is why we've now purchased our second 32 ton lorry to speed business up even more. The Scania is equipped with a telescopic Manitou forklift truck on the back, and it means we're able to place the turf exactly where our customer's want it. As you can see the Manitou can carry plenty of turf, especially when it's rolled and laid out neatly - which is always the case with George Davies Turf. The improvements in our vehicles down the years show just how far our business has come and here you can see the matching Scania and Manitou in action. 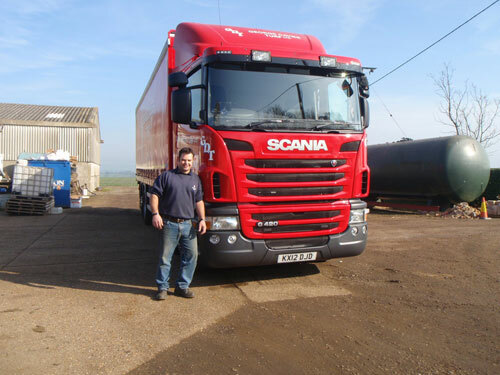 This photo shows George himself at our yard beside the Scania G420 which was purchased back in 2012. Very much a usual day at work, and as you can see from the smile on George’s face, he was just setting off to make another timely delivery. 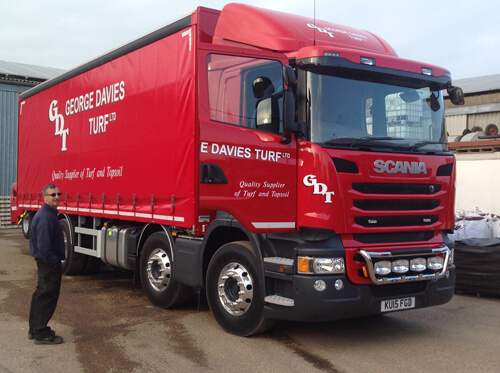 2015 saw George Davies Turf expand our range of products, but we also welcomed another superb Scania to our fleet. This is the R410, and as you can see in the next photo, our series of lorries have come a long way over the last decade. 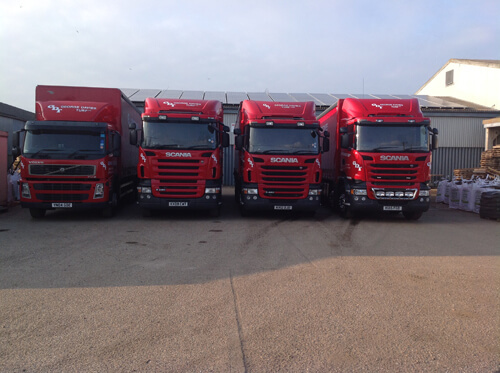 Over the years our lorries became instantly recognisable for their bold red colour with the George Davies Turf logo to each side. This shot at our yard gives you a snapshot of our evolution, and from left to right, we have the Volvo FM9, the Scania R420, the G420 and the R410 - all of which are equipped to make perfectly timed deliveries throughout the UK. Hopefully we’ll continue to add more friendly faces, quality products and high-tec lorries to our business over the next few years, so watch this space.